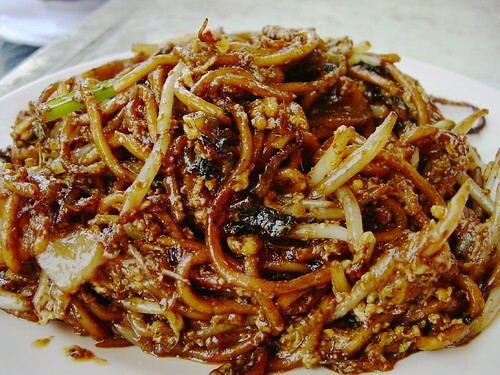 At some wet markets or stalls in Malaysia, you will find hawkers selling fried noodles at an economy price ranging from RM1.00 to RM1.50 per plate / pack. These noodles usually sell well because of the pricing and simpleness in the ingredients used. The type of noodles used are the yellow noodles which are commonly available in the markets themselves. For home cooking, I have cooked this type of noodles once in a blue moon and the usual ingredients which I use are garlic, sliced fish cake, eggs and bean sprouts. Sometimes I do add in a little chinese green mustard leaves (sawi). It is pretty simple to cook though the preparation of the bean sprouts can be a little time consuming when removing the tail / root. Loh Mee is literally translated as “Stewed / Braised Noodles”. 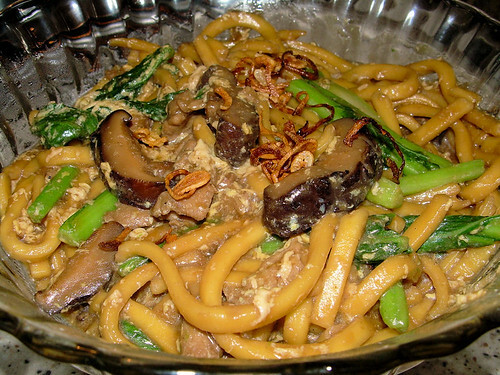 Whilst it is not stewed as long as say, a meat dish, nevertheless the cooking time is longer for this type of noodle compared to other types. Oh, by the way, Loh Mee is in the hokkien dialect. There are two known types of stewed noodles here in Malaysia, the other being Lam Mee. The gravy is slightly different. Braised Noodles with Stewed Pork Slices is again, one of my experiments. Setting up this blog has resulted in me having to experiment with new recipes so that I can keep up with my postings! Haha! Before you go “wah!” about this dish, let me tell you first that it is more a dish / recipe of convenience and simplicity than sheer cooking-from-scratch. So, the stewed pork slices come from the can and the noodles are from Sitiawan, Perak (where I previously cooked Sitiawan Noodle ala PabloPabla). Feel free to use any type of instant noodles but I think it will work well with the noodles which are slightly flat, not unlike fettuccine or linguine. As for the result, it’s simply delicious! Hochiak! Using a non-stick frying pan if available, fry the eggs in a couple of batches to form thin layers of fried egg. Cut the fried eggs to strips. Next, boil sufficient water in a pot. Cook the noodles till al-dente and then, run it over cold water. Place them in a bowl. Drizzle the sesame oil over the noodles and stir well. Place aside. Heat oil and saute garlic with carrots. Add fish sauce and about 50 ml of water. Open the tin of stewed pork slices and pork half of the stew into the carrots. Let the gravy simmer, add the rest of the water plus seasoning. Add the cooked noodles and bean sprouts and reduce to medium heat, stirring well to ensure noodles are coated with gravy. Cook for not more than 2 minutes. Meanwhile, with the frying pan, heat up the pork slices with the remaining gravy from the tin till it begins to boil. Remove from heat. Pour gravy onto the noodles and mix well. 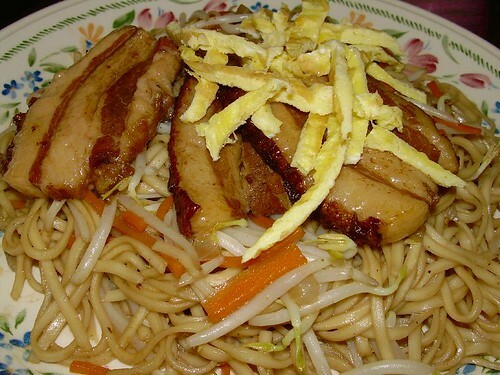 Serve noodles onto individual plates and garnish with egg strips and pork slices.